Having an in-ground swimming pool in your garden will not only add value to your property but brings a range of lifestyle benefits. Living with water is a whole way of life for many of us, and nothing beats those family memories of having the children giggle and play in the pool on a hot summer day, a little exercise after work or a barbecue fired up on the deck beside it. In case you consider having a backyard oasis yourself and look around lush hideaways, you will find that most pools are made of concrete and not fibreglass. 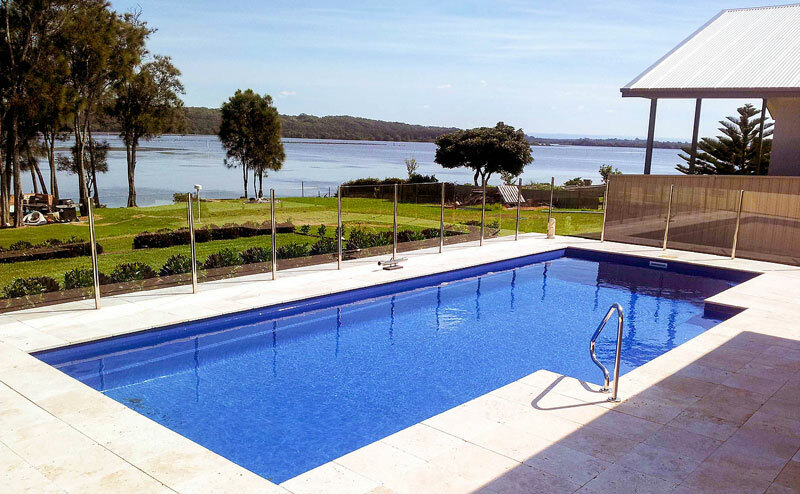 If you are struggling with the decision what kind of in-ground pool to get, this 2 part blog series will unravel the underlying reasons why most individuals choose concrete pools over fibreglass for their family home. When it comes to pool replacement, in 95% of the cases our company is asked to remove fibreglass pools and replace them with a new concrete structure. This is due to the matter that fibreglass pools age very quickly and are hard to renovate. The most common problem with a poorly installed fibreglass pool is the allowance of water getting down between the shell and its excavation. Once the dirt gets wet, the sides of the pool will slump and eventually crack. Another reason for getting called are water problems on a property that has drainage issues, as groundwater and fibreglass just don’t mix. Resurfacing faded or bubbled fibreglass is expensive with a high change of bowing pool walls and floor when emptied for the renovation. Regarding maintenance, a fibreglass pool is demanding since it has tapered walls with a support fold that needs to be swept regularly making the gel coat on the interior surface fade with the sun due to overuse of chemicals. A natural pebble or tiled interior as used for concrete pools will never fade and always look clean. Hence a concrete pool structure is low in maintenance and will last for decades. If you’re thinking about getting a fibreglass pool, keep in mind that the pre-manufactured shell will have to be transported by road. You might even need to provide access for a crane to lift the pool directly onto your site. A fibreglass shell is designed to use natural terrain to get its strength, and if more than 600mm out of the ground, more steel needs to be put into the structure to strengthen it. A bond beam of about 600mm encroaching the design is required, which is three times more than that for a concrete pool which only needs 200mm and will blend into the surrounding. Concrete swimming pools are customised, built on site and can be anchored to the solid rock. With fibreglass pools, there is always the danger of slipping away into the landscape when water problems occur on the property. Read on to find out more about the concrete pools vs fibreglass pool debate in the 2nd part of this blog series.